Who’d have thought that oranges, beets and fennel would go together and make a great salad. I saw a photograph and the recipe and was fascinated. I love all the main ingredients and was happy to try them together. I’m glad I did. The root and fruit flavors meld beautifully under a couple of spoonsful of citrus juice and drizzle of olive oil. This salad is so beautiful, it deserved a plate of its own. It will get that on a weekend or for company! Orange, beets and fennel in citrus juice is a wonderful salad. I served the salad with grilled lamb shoulder chops and three bites of potato with a yogurt dill sauce. When I get a crave lamb, I frequently get shoulder chops. They are thin, have a bit of bone in them and grill beautifully in mere minutes. I season them with a light rub of olive oil, a sprinkle of salt, pepper and garlic power and a generous shake or two of dried oregano that I rub into the meat and seasonings. You get a great lamb meal at a very reasonable $4.99/lb. I had two chops in a package for under $4.00. Lamb shoulder chops, potatoes with yogurt and dill, and a beet, orange and fennel salad. It’s beginning to taste like spring! Preheat oven to 400º. Wash beets, leaving some water on skins. Wrap individually in foil; place on a rimmed baking sheet and roast until beets are tender when pierced with a knife – about 50 minutes to an hour. Meanwhile, using a sharp knife, cut and discard all peel and white pith from the oranges. Working over a medium bowl, cute between membranes of two blood oranges to release segments into bowl. squeeze juice from membranes and discard membranes. (I can’t do this. I eat the membrane because there is always tissue and juice left on them to savor.) Slice remaining blood orange and Cara Cara oranges crosswise into thin rounds. Place sliced oranges in bow with the segments. Add lemon juice and lime juice. Peel cooled beets. Peels should be loose and slip off the beets with gentle finger rubs. Slice two beets into wedges. Cut remaining two beets into wedges. Strain and reserve citrus juices. Layer beets and oranges on plates, dividing evenly. Arrange fennel and onion over beets. Spoon reserved citrus juices over assembled salad and drizzle generously with olive oil. Season with salt and pepper. Let salad stand for five minutes to allow flavors to meld. Garnish with cilantro and/or chervil leaves. *Fresh beet leaves can be removed from the stems, chopped and steamed as a side dish. I like to steam them with paper thin slices of garlic. ** Fennel leaves may be stripped from their stems and sprinkled over the salad as a garnish. I’m not going to waste a drop of the homemade crème fraîche. This morning, I sliced and broiled blood oranges, navel oranges and a tangerine. I let them cool a bit and topped them with strawberries and the crème. Broiled citrus, strawberries and creme fraiche. LUSH! 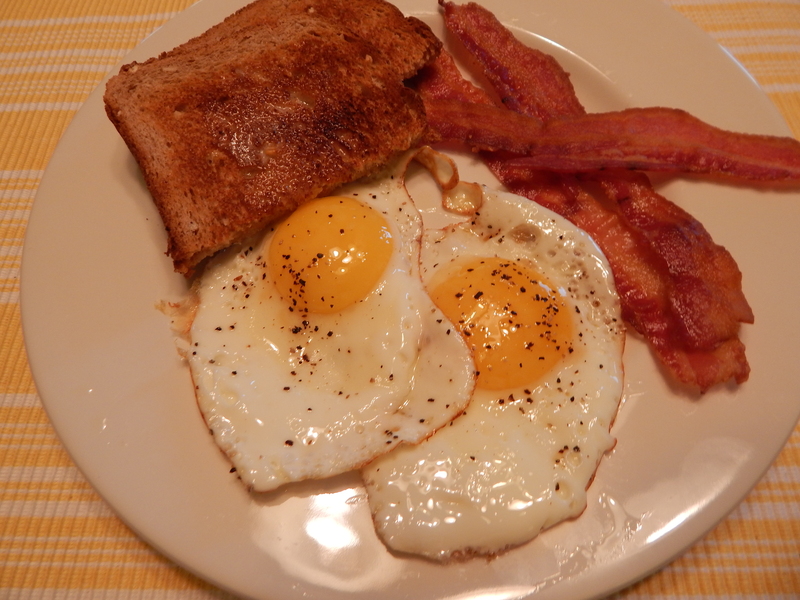 And on the side – bacon, sunny side up eggs and toast. Don’t tsk!, tsk! me. It could have been biscuits and gravy on the side! Who says you can’t have dessert at breakfast? With a little preplanning, you can have the best strawberry treat ever! Berries, lightly macerated overnight with a little sugar, then topped with crème fraîche is amazing. Sweet-tart strawberries and a silky and slightly tart crème will make your breakfast fruit seem like dessert. Making crème fraîche is simple. It just takes a little pre-planning and a little patience – at least 12 hours of patience! The result is thicker than whipped cream and not as thick as sour cream and doesn’t taste like either. Make your breakfast fruit feel like dessert with this easy recipe. 1 Cup heavy whipping cream. Try to find just pasteurized instead of ultra-pasteurized. You can use the ultra, but it won’t be quite as thick or quite as tart. Pour cream into a glass container. Stir in buttermilk. Cover with a clean cloth or cheesecloth and place in a warm, draft free place (I do mine on top of the refrigerator.) from 12 to 18 hours to thicken. The bacterial action that thickens the cream will also prevent spoiling, so don’t worry about it being left out. After 18 0 20 hours, remove cloth, stir well, cover and refrigerate. It will keep in the refrigerator up to a week. Mine rarely last’s more than a day! Cream and buttermilk covered and thickening on top of the refrigerator under the watchful eye of San Pascuale, often called the patron saint of gringo cooks in Santa Fe. Stir and use as a toping on fruits. You can also add it to soups and stews. It does not break or clot the way cream or sour cream can. 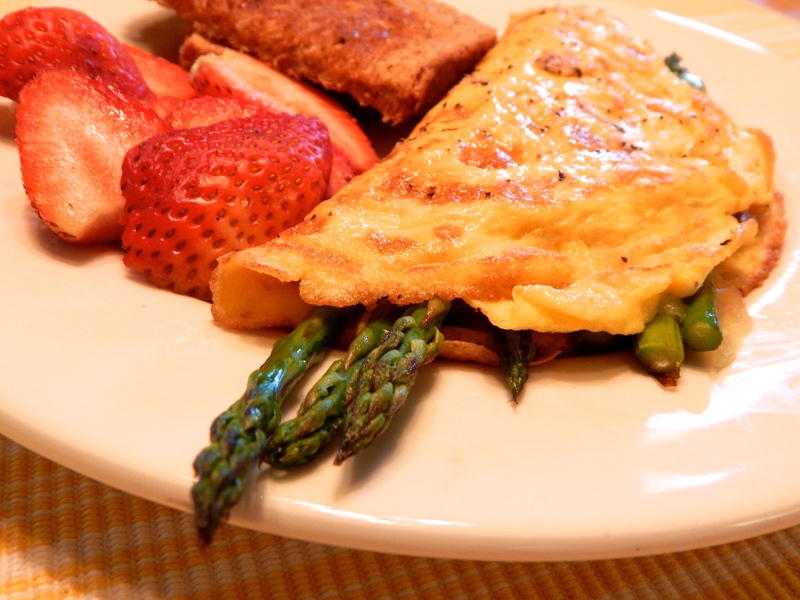 It must be spring if breakfast is asparagus and strawberries. 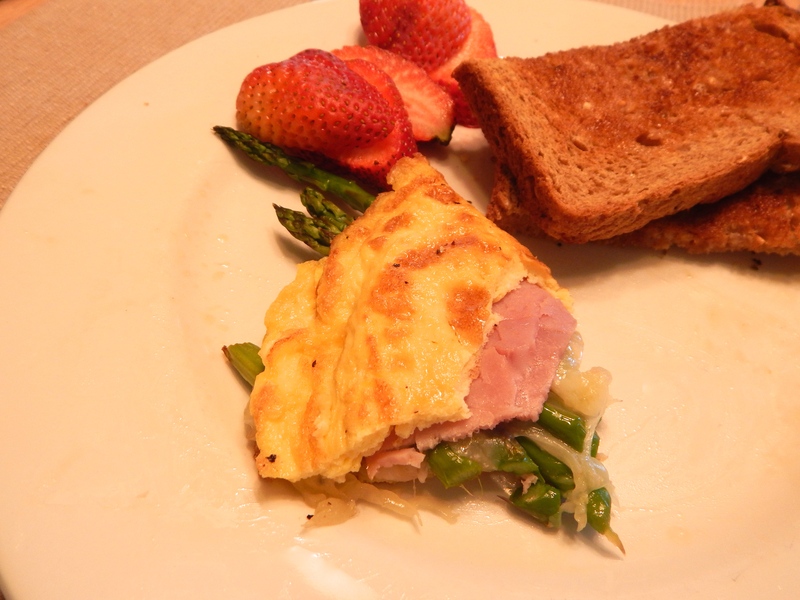 Asparagus, ham and Swiss cheese is my favorite spring omelette. When I find fresh asparagus in the market, I jump on it and get some extra so I can have it at dinner and again for breakfast. My favorite way at breakfast is to pan roast it on the stove top with a little butter until the color darkens a bit but it still has a little crunch. A slice of ham and some Swiss cheese make it just right! I had some strawberries on hand, so a few slices of fresh berry were a perfect complement to the green taste of the asparagus. A slice of multigrain toast finished off the meal. I told you it was a favorite. Here are that last couple of bites of breakfast bliss. Roasted Cucumbers? Who’d a Thunk It! I’m still playing with the new Sheet Pan Suppers cookbook I downloaded. 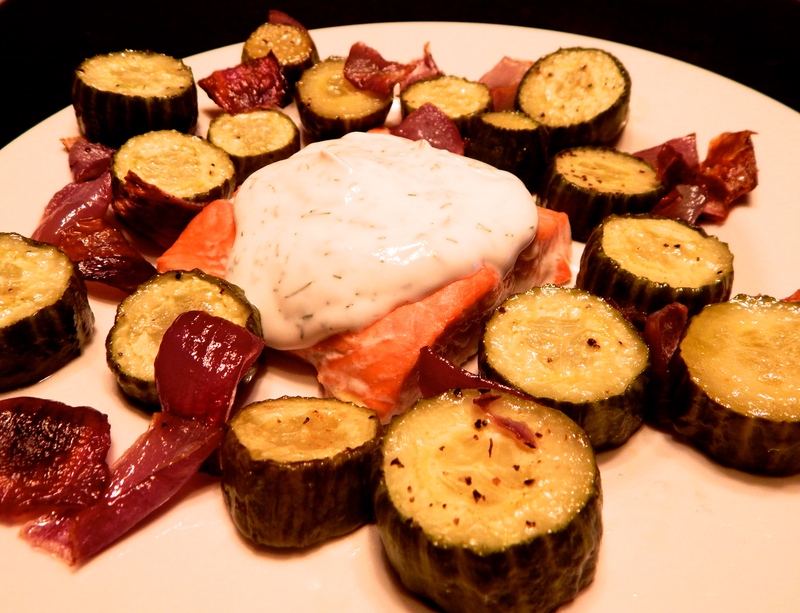 I tried a salmon with roasted cucumbers and yogurt dill sauce recipe and liked it very much. It uses Persian or English cucumbers, also called hothouse cucumbers – the long, thin, dark tender skinned ones. Cut them into 1/2 – 3/4 inch slices and toss with a little olive oil, salt and pepper. Chop a red onion in about a one inch dice and toss with the cumber. Roast on a foil or parchment lined sheet pan at 425º for 20 minutes, then toss them around a little and move them to the perimeter of the pan. Put skinless fillets of salmon on the pan, skinned side down and return to the oven for 10 to 15 minutes until the salmon is done to your liking. While the roasting is going on, mix Greek yogurt, dill and lemon juice and let it sit while the the cukes and salmon finish cooking. Checking on the roasting cucumbers, onion and salmon. The roasted cucumber is firm, but not crisp on the outside and moist and tender on the inside. The flavor is squash-like. It reminded me of roasted zucchini, but with a different texture. 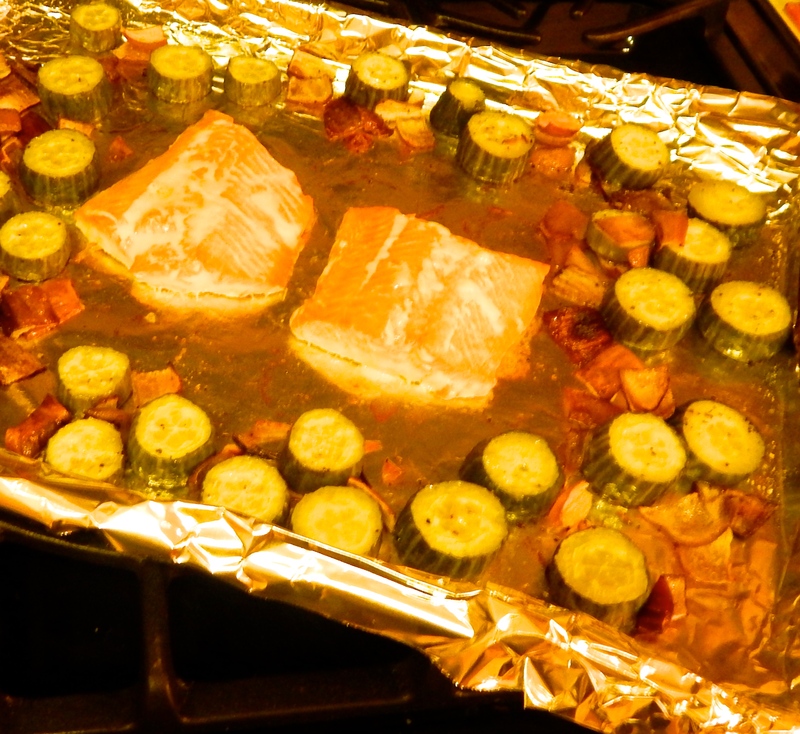 The yogurt dill sauce was as good as you’d expect on the salmon, and pretty darned good on the squash, too. You just can’t go wrong with yogurt, dill and lemon on anything! I get at least one Amazon e-mail a day promoting e-books books. Mostly, I can browse and delete. But sometimes… I do find something. For instance, a cookbook called Sheet Pan Suppers, by Molly Gilbert. The book is subtitled “120 recipes for simple, surprising, hands-off meals straight from the oven.” I downloaded the free sample chapter and within minutes was hooked. The 1-click icon had the book on my iPad in just a couple of minutes. Ms Gilbert’s thesis is that one pot meals tend to be stewy and soupy for the most part and can become boring over time. Her one pan cooking ideas provide more variety for simple cooking. She begins with a primer on the sheet pan: sheet pans are baking sheets with a 1″ rim; whether aluminum or stainless steel, heavy weight is best; sizes range from the 18″X 26″ full sheet down to to “23” X 18″ half and 13″ X 9″quarter sheet sizes more manageable in home kitchens; how lining the sheet with aluminum foil and a spritz of cooking spray or with parchment paper makes clean up easier. Then the fun begins. Her recipes run the gamut from appetizers to poultry, seafood, meats, vegetarian dishes, sides, brunches and breakfasts to desserts. She describes the dish, guides you through the ingredients with a little bit of “why this” and “why that,” then, under the heading “LET’S COOK:” takes you through putting it all together and into the oven. For a graduate of the French Culinary Institute, she writes a very user friendly book. I’m going to get a lot of entertainment and some good eats out of this one! 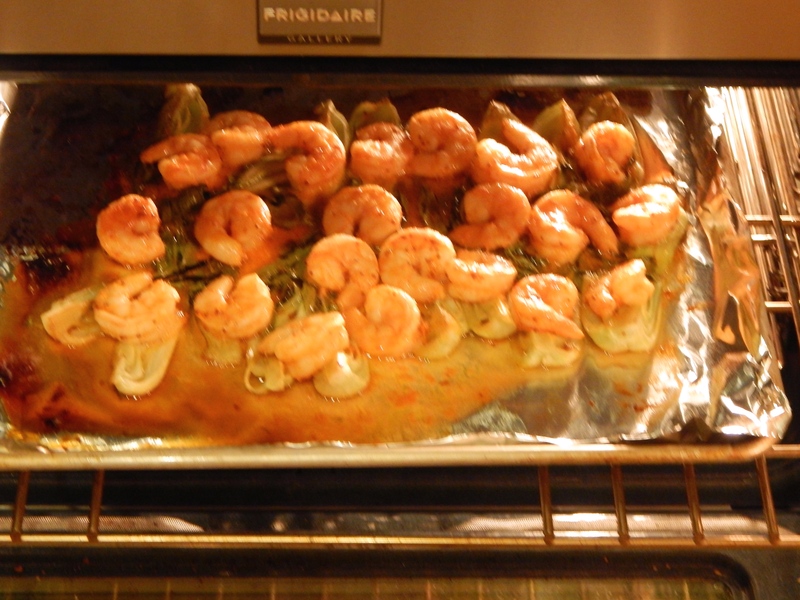 Honey-Orange Shrimp on Glazed Baby Bok Choy cooked on my 18″X13″ half sheet pan. After I try a few of her recipes, I’ll share the adventure with you. Right now, cooking on one sheet in the oven sounds great. My first experience with Honey-Orange Shrimp with Baby Bok Choy was successful. 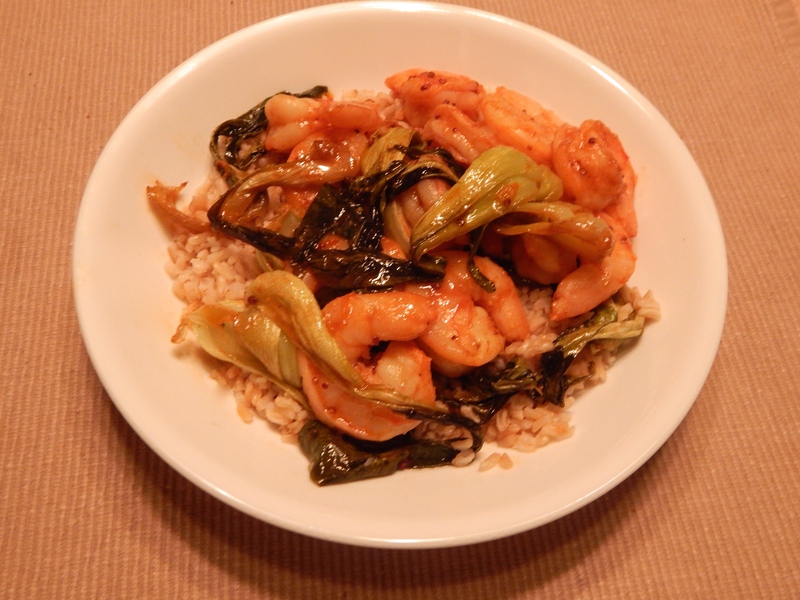 The shrimp in a spicy orange marinade atop baby bok choy roasted with a sweet and salty glaze was a taste hit. While it cooked on only one pan, mixing the marinade and the glaze used a good measuring cups, spoons, bowls and baggies. I think part of that is the recipes and part of it is my handling the mixing. I’ll be able to streamline the process considerably next time. Fortunately, the assembly tools all go into the dishwasher. I did cook rice in a separate pan, but that was an option I added. The marinade and bok choy glaze were Asian-like and just cried out for a rice accompaniment. I used brown rice, but wished I’d had jasmine rice in the pantry. An orange, chili sauce, garlic and dijon mustard marinade creates sweet and spicy shrimp. It is complemented by a honey, soy and butter glaze on baby bok choy. A base of rice assures you won’t be hungry again in 30 minutes. You may have read my whiney post about grilling in the wind. I was sorely traumatized by how the wind messed with the temperature of the grill, how the grill thermometer didn’t seem to be anywhere near accurate, especially when compared to the meat temperature checked with my instant read thermometer. I am not one to let a little West Texas wind stop me grilling with charcoal again, especially after a hiatus of around 30-something years grilling with gas. I’m not giving up my gas grill, just expanding my outdoor cooking options. Last night, there was just a pleasant breeze at dinner time, so I gritted my teeth and lighted another fire using lump charcoal. I used a chimney starter and had just enough time to enjoy a Big Bend Brewery #22 Porter while the charcoal blazed and turned into glowing embers. Big Bend Brewery is a young venture in Alpine, Texas, a few hours down the road. I’ve been impressed with them since discovering their brews on tap at the Reata, one of my very favorite restaurants. The #22 Porter is named in honor of the Southern Pacific rail road depot in Alpine. It is still in use today. I rubbed chicken thighs with Tajin, a chili lime power, and a little garlic powder. The Tajin is a great flavor compliment to grilled or roasted chicken and pork. I let the thighs rest while I prepared and cooked a parmesan-roasted cauliflower side dish. It is as satisfying and more flavorful than roasted potatoes. The chicken thighs turned out as moist, tender and flavorful as I had hoped. Their slight chili and citrus under taste worked with the freshness of the salad and the rich depth of the cauliflower. You might thing of roasted cauliflower as a winter side dish, but I found it just as good for a pleasant spring evening. 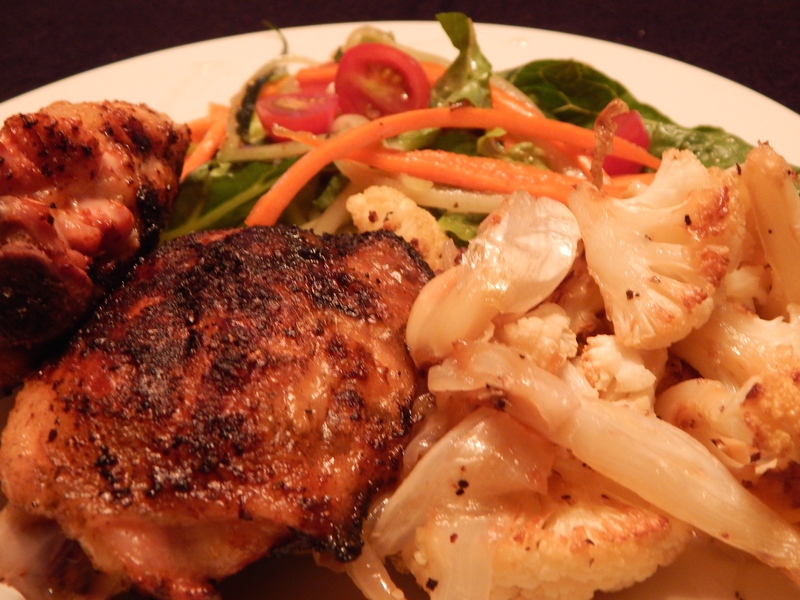 Charcoal grilled chicken, a simple salad and roasted parmesan cauliflower on a Sunday evening. Toss cauliflower florets, onion, garlic cloves and thyme sprigs with olive oil to coat. Season with salt and pepper. Roast in oven, tossing occasionally for about 30 minutes. Cauliflower will be almost fork tender. Remove from oven, toss with cheese and return to oven for about 10 minutes more. Cauliflower will be tender, with a little color and cheese will be melted into the vegetables. The garlic cloves are roasted tender, I you are lucky enough to get one or more, squeeze it out of the skin onto the cauliflower for an extra flavor treat. Some times you win; sometimes the wind wins. A while back, I came across a pack of four beef tenderloin fillets marked down for quick sale. I snatched them up and put them in the freezer for a special occasion. The occasion arrived. Clean out the freezer Friday! Friday evening was cool and breezy. I wanted to use the charcoal grill. I used lump charcoal – far better than briquets for higher temperatures and easy starting. I prepped two fillets with a little olive oil, garlic powder, salt and pepper. I found baby pattypan and zucchini squash at the market, so I tossed them with a little oil, salt and pepper and put it all on the grill. I learned that the thermometer on the charcoal grill reads low. I kept checking the meat with an instant read thermometer and was getting readings higher than the grill thermometer. Because of the wind, it all took longer than anticipated to cook. The result was sad. My baby squash were cooked unevenly and the tenderloin dried out a bit. I blame it all on the wind and the havoc it wrecked on temperature control. The meal was edible, but not what I had hoped it would be. I didn’t photograph if. Then, Saturday came along. I still had two fillets in the fridge and I was determined to do them justice. I decided to cook them indoors. That was a good choice, because the evening wind picked up again. I began by setting the tenderloin out to come up to room temp. While I waited on that, I peeled and sliced an onion and started it sautéing in a little butter. I let the onion soften and take on a little color, then added a good splash water and a teaspoon of Better Than Boullion beef base to the pan and stirred it in well. A little more water helped soften the onions even more and they absorbed the intense beef flavor of the beef base. I let them reduce to an almost confit consistency and then added a health splash of brandy to the pan and let it simmer with the onions for a few minutes. Then I took the almost confit off the burner and turned my attention to the fillets. I seared the fillets on both sides in a hot dry pan, then popped the pan into a 375 degree oven. After 10 minutes, I checked the internal temp of the meat with my trusty thermometer, turned them offer and put them back in the oven for three minutes. I then removed my fillet from the pan and tented it while the other fillet cooked a little longer to suit the other diner’s taste. I plated the tenderloin on the onion almost confit with a twice baked potato half and a generous serving of Tuscan (dinosaur) kale and shaved raw Brussels sprouts in a dijon mustard vinaigrette and a little grated pecorino cheese. The salad was a good sharp contrast to the sweetness of the onion. I’m happy to report that the Saturday meal was far superior to the windy grilling adventure and very satisfying for us both. Kale and Brussels sprouts salad is a tart counterpoint to the sweet onion almost confit served with a medium rare tenderloin fillet. A half a twice baked potato rounds out the plate. Combine lemon juice, Dijon mustard, shallot, garlic and 1/2 tsp kosher salt in a small bowl. Stir to blend and set aside to let flavors meld. 2 bunches Tuscan kale (about 1-1/2 lbs), center stem removed, leaves thinly sliced. 12 oz Brussels sprouts, trimmed and finely grated or shredded with a knife. I used the slicer side of a box grater and held the sprouts by the tip while grating. When you reach the tough core of the sprout, it is time to let go and save your finger tips. Spoon a tablespoon of olive oil into a small skillet; heat oil over medium-high heat. Add almonds to skillet and stir frequently until golden brown in spots, about 2 minutes. Turn almonds out onto a paper towel lined plate. Sprinkle lightly with salt and let cool. Add dressing and cheese to sprouts and kale and toss to coat. Season lightly with salt and pepper. Plate and garnish with almonds. We love Sofi’s Restaurant for breakfast after the gym. One of our favorites there is Huevos Divorciados or Divorced Eggs. The dish is a riff on Huevos Rancheros. Instead of Sofi’s eggs and green chile con carne on tortillas topped with eggs fried to your liking, the Huevos Divorciados have one tortilla topped with red chile con carne and an egg and a second tortilla topped with green chile con carne. This isn’t Santa Fe so you can’t call it “Christmas” for breakfast! Both dishes are accompanied by small diced fried potatoes and refried beans with flour or corn tortillas on the side. Its a hearty breakfast that is a special treat and not a regular thing. Today, I woke with a chile craving. That happens many mornings in this household. I remembered I had some leftover of green chile con carne in the fridge and decided to use that as a base for breakfast similar to what I might get if I dressed and drove to Sofi’s. I heated the leftover chile and reduced the liquid considerably. I wanted it a thicker than when it was a stew the other night. While that simmered, I prepared to poach a couple of eggs to top it off. I enjoy both making and savoring poach eggs for breakfast. I skipped the potatoes and refried beans, but did serve it with corn tortillas on the side. Of course, I had a little butter nearby for the tortillas. The egg yolk gave the chile a different mouthfeel that was very pleasant. The tortillas were great for sopping up all the juice at the bottom of the bowl. When the kids were small, breakfast for dinner was a big treat. Now they are grown and I get to have dinner for breakfast! My treat was green chile con carne with poached eggs! 1 Tbsp white vinegar in a individual ramekin or custard cup for each egg to be poached. 2 Tbsp white vinegar in a wide pot or pan that will hold water at least three inches deep. Put one Tbsp white vinegar into a ramekin. Carefully crack an egg into the ramekin with the vinegar. Let the egg sit in vinegar at least five minutes. Many people only add vinegar to their poaching water, but I like to let my eggs sit in vinegar before poaching. This step helps keep the egg stay closer to the yolk of the egg rather than string all over the pan. Add water to three inch depth in pan, add 1 Tbsp vinegar to the water. bring to a slow boil. Stir the water wide and deep to create a vortex. Careful slip the ramekin lip into the water and quickly slip the egg into the water. Maintain your swirl around the egg. The white will begin to gather around the yolk. Adding the vinegar and water and egg will reduce the temperature of the water. As you continue to swirl the egg gently, keep the water temperature at a rapid simmer. When the egg white has set around the yolk and you feel it is done to your taste (I like a really runny yolk, but want the white set), carefully lift the egg from the water with a slotted spoon. I drain my eggs on a plate lined with a paper towel while I cook the next egg in line. Draining the eggs ensures you don’t get a vinegar water taste when you eat them. You’ll still get some egg white strings in the water as you cook your eggs. If you do, raise the temp of the water between cooking eggs and you’ll get a foam of egg white you can remove from the pan with your slotted spoon. Reduce the water temp before adding subsequent eggs. My DNA test shows me to be about 15% Irish Ancestry. I do know my maternal great grandmother was Irish, but not much else. I count a fondness for Guiness Stout and Harp lager and black and tans as positive evidence. I like both Jameson’s and Buchanan’s Irish Whiskeys, as well. And, there’s no denying a fondness for corned beef and cabbage and the accompanying potatoes and carrots served in a bowl with just a wee bit of the broth. 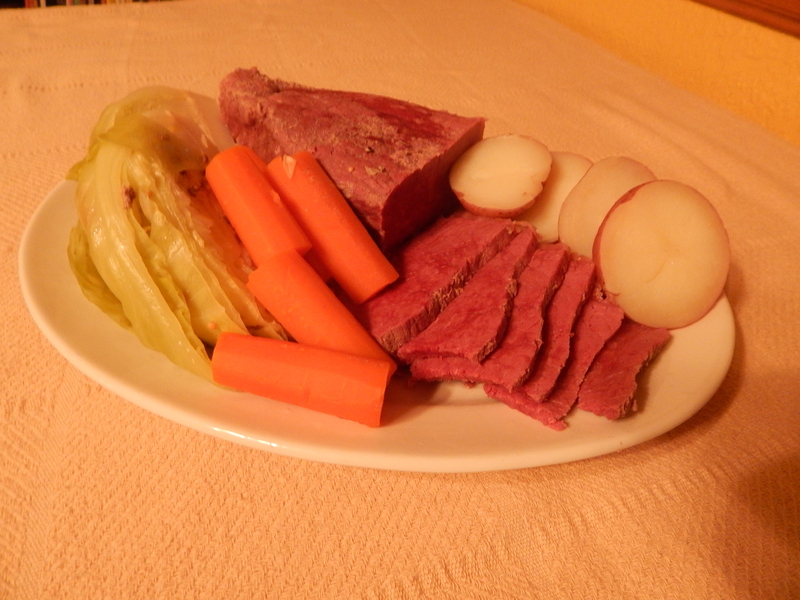 St. Pat’s dinner on a platter: corned beef, cabbage, carrots and potatoes. Irish Soda Bread baked in a cast iron skillet. Quick and easy! Stir the liquid into the dry ingredients and mix well. Scrape out of the bowl onto a very well floured surface. Flour your hands well and pat the sticky dough into a disc shape. Transfer the disc into an ungreased cast iron skillet. Bake for 20 or so minutes until the crust is firm to the touch. Turn out of the pan and let cool a bit; slice and enjoy. I found the bread to be much like a giant baking soda biscuit. It was wonderful with a smear of butter (Kerry Gold, of course) and dunked in the corned beef broth. A little Irish blessing, a corned beef dinner and bottle(s) of Harp’s lager.